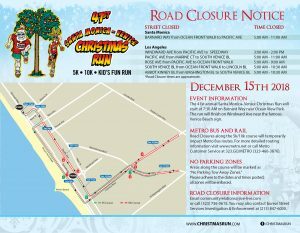 The Christmas Run 5K and 10K course will start on Barnard Way (near Ocean Park Blvd.) and run along sunny Santa Monica Beach. The run will move south from Santa Monica, down the Venice Boardwalk onto the streets of Venice, and finish at the famous Windward Plaza. 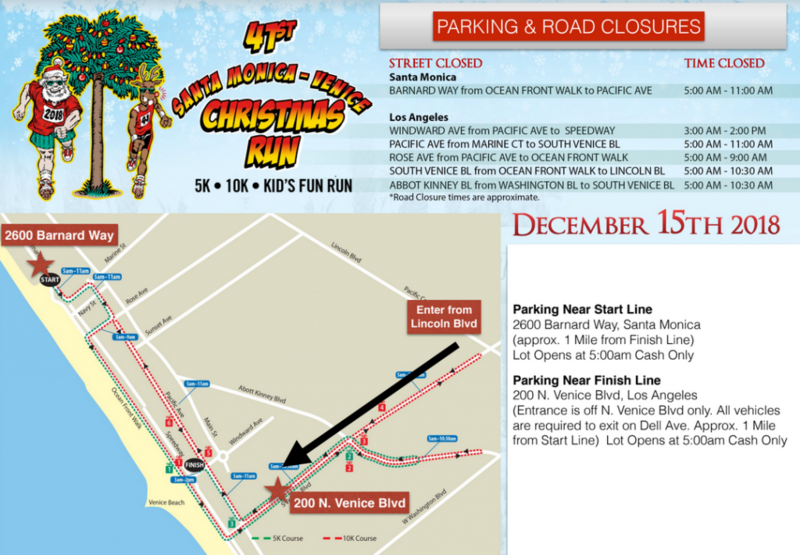 Parking lots are available in Santa Monica and Venice along Barnard Way (near the start line), at the end of Rose Avenue and on North Venice Boulevard (about 1 mile from the finish). Current lot fees will be in effect. Map below. We encourage all participants to make use of public transportation, including Santa Monica’s Big Blue Bus line, Los Angeles Metro buses and the Metro Expo Train Line. Of course, bicycles are always welcome. However, be sure to bring a sturdy lock as the Christmas Run is not responsible for lost or stolen bicycles. Other creative ways to get to the start/finish include Uber/Lyft, urban scooter rentals, and ride sharing with friends. Entrance is off N. Venice Blvd only. All vehicles are required to exit onto Dell Ave.
Road closures for the race begin at 6am. There will be more than 5,000 runners and thousands of spectators arriving on race day, so please plan accordingly. Allow yourself enough time to find parking at the start or finish line. READ CAREFULLY! IMPORTANT RACE DETAILS! NEW: Registration Protection Program: Through the imATHLETE registration website, you can opt to buy registration cancellation coverage. See imATHLETE.com for more information. EDIT YOUR REGISTRATION: To edit your registration CLICK HERE. The deadline to edit your registration is December 9th. After December 9th, any changes can ONLY be made at Packet Pick-up. GEAR CHECK: Will NOT be provided for this race. Please plan accordingly. The Christmas Run is not responsible for any personal belongings left unattended. RESULTS: Will be posted on the race website within 24 hours. NO age division awards will be given. COSTUME CONTEST: The contest is scheduled for 8:30am for the 5k Race and again at 10:00am for the 10k Race and will take place at the Finish Line at Windward Ave & Pacific Ave. 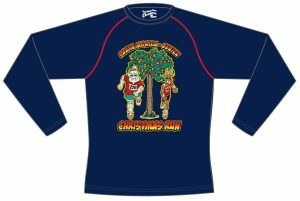 SHIRT SIZES: All pre-registered Christmas Run participants will receive (1) Christmas Run long-sleeved tech shirt as part of their packet. Because this race will sell out, we unfortunately CANNOT accommodate any size exchanges. Refunds and Transfers: As a reminder and per standard race policy, all entry fees are non-refundable and non-transferable. This policy includes illnesses and unexpected emergencies or injuries. If you cannot attend the event, shirts will not be mailed after the race. Refund/Transfer Policy: If not covered by imATHLETE registration protection program, all entry fees are non-refundable, non-transferable. No exceptions. This policy includes illnesses and unexpected emergencies or injuries. NO exceptions. Management may alter the course and distances for the safety of athletes at any time. The Christmas Run reserves the right to reject any entry. By viewing or participating in the race or any of its activities, you are giving the Christmas Run, affiliates or contractors permission to use those photographs for promotional and marketing purposes without notification or compensation. No mail-in registrations will be accepted. Online and in-person registration only. Online registration will be conducted via the imATHLETE platform. 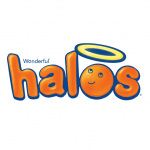 All participants must be physically prepared to take on the challenge of a 5K/10K and/or Kid’s Fun Run. All participants must show photo ID to receive your race bib and timing chip. Minors under 16 must be accompanied by an adult. All participants must pick up their race packet at the specified locations on Friday prior to the race or Saturday morning prior to the race. Kid’s Fun Run participants must be 12 years old or younger. Recommended for age 5 and up. Parents are encouraged to run with their child but not required to pay for adult registration. Official timed results will be posted near the finish line at the completion of the race and on christmasrun.com.